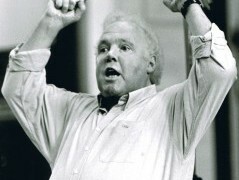 The New Zealand-born conductor Gary Brain has died in Paris, aged 72. Gary was a percussionist in Wales, Ulster and at the Royal Opera House, London. He became principal timpanist with the New Zealand Symphony Orchestra but on a flight to the US a suitcase fell from an overhead locker and crushed his wrist beyond repair. He retrained as a conductor, working with Rafael Kubelik and Lorin Maazel. He won a Preis der Deutschen Schallplattenkritik for reviving th music of the Swiss-Polish composer Czeslaw Marek and went on to make quite a few recordings for Toccata Classics. Martin Anderson remembers him here. So very sorry to hear this. He was a very respected musician and conductor. [I always had it in mind to send my edition of Antoine Reicha’s ‘Symphonie Concertante pour Deux Violoncelles etc Orchestre’ to Gary as he was a specialist in Reicha’s symphonies. He would have been the go to man for this]. I wish his close family and friends heartfelt sympathy, and all the musicians who worked closely with him during his career as a tympanist and conductor. Thank you for the sensitive tribute to Gary. In my teens in the 1960s I went to as many concerts of the then New Zealand National Orchestra as I could ( it is now the NZ Symphony Orchestra ) so Gary was a familiar figure in the percussion section . He ran a programme in schools which, I understand , was greatly enjoyed and still remembered by those attending his sessions . News of his accident was shocking , especially because it was avoidable , and I am glad he developed his career as a conductor and had a happy personal life .